For the student of military history, the Papuan Campaign is most noteworthy for the tactical aspects of its final or beachhead phase, for it was at the Buna-Gona beachhead that the Allies, for the first time in World War II, encountered and reduced an area fortified and defended in depth by the Japanese. Although the attack was from the landward, and succeeding campaigns generally from the sea, the basic tactical situation was the same--the Allies were attacking and the Japanese were defending an elaborately fortified area. The essential difference was thus not that Buna was a land operation while the succeeding operations were amphibious; it was rather that in later campaigns the attacking troops hit the beachhead better prepared and supported, with a variety of tactics and weapons for the speedy reduction of the Japanese positions. In the Buna area, on the other hand, poorly supported Allied infantry attacked again and again in vain; the action took on the aspect of a siege, and starvation was a significant factor in the enemy's final collapse. American conduct of operations was to profit from Buna as from few other campaigns, and the profit was to accrue not only in the negative sense, but in the positive sense as well. their rifles, machine guns, mortars, and hand grenades. Throughout the fighting, General Eichelberger had been a man under pressure. Told by General MacArthur on 30 November that "time was of the essence," on 13 December that "time is working desperately against us," and on 25 December that "if results were not achieved shortly the whole picture [might] radically change," General Eichelberger had pushed the attack in every way he could.2 On 18 December, though able to report progress, he nevertheless made it a point to assure General MacArthur that he "never forgot for a moment that we have not much time. . . ." On 30 December, when General Herring asked him why he did not let his troops "take it easy since the Australians were not going to do anything today or tomorrow," Eichelberger had replied that he had no intention of doing so, for he had always considered that "time was the essential element of the attack. "3 Whether GHQ realized it or not, hurrying the attack had become the leitmotiv of the campaign. During the six months that the Australian ground forces had been in action, they had committed seven infantry brigades and one dismounted cavalry unit of battalion strength.4 Though there were times when elements of as many as four brigades were in the line, the Australians usually had no more than three brigades (roughly 7,000 to 7,500 men) in contact with the enemy at any one time. Sometimes they had as few as two and, during the opening weeks of the campaign, less than two. The campaign cost the Australian ground forces, 5,698 battle casualties--1,731 killed in action, 306 dead of wounds, 128 dead from other causes, and 3,533 wounded in action.6 American ground casualties were 2,848--687 killed in action, 160 dead of wounds, 17 dead from other causes, 66 missing in action, and 1,918 wounded in action. The diarrheas, the anemias, and the hookworms yielded to treatment, but much of the malaria did not. Neither rest, suppressive drugs, nor special care proved of avail in more than half of the cases treated. The patients got worse instead of better. Relapse followed relapse until finally the men had to be dropped from the division in September as unfit for combat. The total number dropped at the time was 2,334 officers and men,16 all of them casualties of the campaign just as surely as if they had been wounded in battle. With the story presumably the same in the case of the Australians, the conclusion is inescapable that the fighting in Papua had been even costlier than had at first been thought, and that the victory there, proportionate to the forces engaged, had been one of the costliest of the Pacific war. 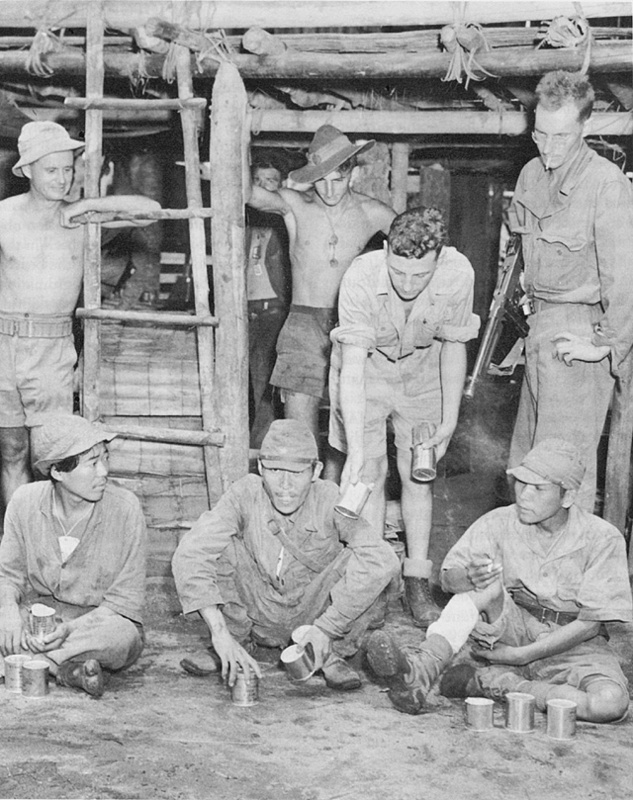 JAPANESE PRISONERS AT DOBODURA eating canned rations supplied by Australian soldiers. These prisoners were brought in by 163d Infantrymen. prisoners.18 The Japanese apparently buried the remaining 4,500 or 5,000. Starvation had worn down the enemy troops and had contributed directly to their final defeat. The evidences of cannibalism that the Australians and the 163d Infantry encountered on the Soputa-Sanananda track, and the emaciated enemy remains the 127th Infantry found scattered about in the Giruwa hospital area were indicative of the level to which the Japanese had been reduced during the closing weeks of the campaign. How greatly their resistance was undermined by starvation during the weeks immediately preceding was another matter not so easily determined. When Gona fell on 9 December, the Australians found some moldy rice and a little ammunition left--enough for only a few more days of fighting. There had still been a little food and ammunition on hand when Buna Village was overrun on 14 December, but very little food and virtually no ammunition was taken when Buna Mission fell on 2 January. The Japanese had received their last two ounces of rice on 12 January, two days after the 163d Infantry had found indisputable evidence that some of them had already been reduced to cannibalism. As each successive position on the front fell, it became evident from the horrible emaciation of the corpses of those who had defended it that they could not have held their positions much longer even had there been no attack. Maj. Mitsuo Koiwai, commanding officer of the 2d Battalion, 41st Infantry, the only field grade officer of the South Seas Detachment known to have gone all through the campaign and survived it,19 when interrogated at the end of the war, said, "We lost at Buna because we could not retain air superiority, because we could not supply our troops, and because our navy and air force could not disrupt the enemy supply line." When he was asked about the effectiveness of the Allied attack, he agreed that it had been skillfully conducted and then added an observation which had apparently been in the minds of most of the Japanese at the beachhead: "Tactically the Allied co-ordination of fire power and advance was very skillful. However we were in such a position at Buna that we wondered whether the Americans would by-pass us and leave us to starve. "20 It was clear that starvation had been a potent factor in the final reduction of the beachhead and that, had the Allies not been so determined to reduce it by direct attack, hunger would in due course have accomplished the same thing for them. The logistical accomplishment of the air force had been superb. The luggers and the freighters (including the K.P.M. ships) had, it is true, brought in by sea more than three times the tonnage that had come in by air.23 It was nevertheless a fact that the attack could not have been sustained without the airlift, especially during the critical days in November and early December when seaborne supply had been reduced to the merest trickle because of the destruction of the luggers. The reconnaissance of the coasts and of the sea, the sustained attacks on enemy convoys seeking to reinforce the beachhead, and the frustration of the enemy's efforts to establish supply bases at the mouth of the Kumusi and Mambare Rivers showed the Fifth Air Force and the Australian air units brigaded with it at their best. Nor was there anything to criticize in the way the air force spotted for the artillery, or intercepted enemy aircraft over the combat zone. Both tasks were done admirably. The quality of its direct support of ground troops was something else again. Even the statistics of this activity are unimpressive--121 sorties flown, 40 tons of bombs dropped, and 97,000 rounds of .30-caliber and .50 caliber ammunition fired. Though this was light support at best, it brought in its train another difficulty. In far too many instances the pilots bombed and shot up Allied troops instead of the enemy, with grievous repercussions on troop morale. The fact that between 22 December, the date of General Eichelberger's letter, and the end of the campaign not a single request was made by American forces in the field for direct air support26 was an indication of how much the air force had yet to learn about its direct-support responsibility. The role of the Allied Naval Forces in support of the beachhead fighting had been small. Admiral Carpender's reluctance to send his ships into the waters around Buna had from the first ruled out the possibility of a more active role. In the end, except for the activity of the motor torpedo boats, the actual naval support of the fighting at the beachhead was restricted to a single mission--the transfer there by corvette of the successive echelons of the 18th Brigade. blast bomb devised by the Australians, flipped into the bunker. Such devices as satchel charges, effective flame throwers, jellied gasoline (napalm), all used in later Pacific operations, were not available at Buna, but the experience there helped to establish the need for them and undoubtedly hastened their development for use in subsequent operations. The campaign emphasized other lessons, some as old as warfare itself. It drove home the point that troops should be trained in the kind of warfare they are called upon to fight; that they should be habituated to overhead fire during the training period; that they should enter combat "as hard as nails." Although the amount of artillery that general headquarters provided was always far less than the U.S. commanders on the scene regarded as necessary, the campaign demonstrated the soundness of General Harding's and General Waldron's representations to that headquarters that the artillery could go into the jungle with the infantry and, what was more, could be used effectively in jungle terrain. The campaign established that artillery, provided it was of the right kind, was one of the best weapons a commander could have when faced with bunkers of the type that the Japanese had built in the Buna-Gona area. The campaign made clear that there would have to be better communication between ground and air, and that to be useful in the jungle walkie-talkie radios would have to be greatly improved. It established the effectiveness of the sound-power telephone at ranges of up to two miles. It demonstrated that the .37-mm. antitank gun with canister was an excellent antipersonnel weapon and that rifle grenades were highly effective against enemy troops in trenches or dugouts. The campaign also established the need of a lighter and simpler weapon than the M-1 rifle in jungle warfare--a need that the carbine, had it been available to the troops at Buna, would have met. On the medical side, the campaign underlined the need for better distribution to the troops of such items as chlorination pellets, vitamin pills, salt tablets, and the like. It suggested the wisdom (following the successful experience with it on Guadalcanal) of thence forward using atabrine as a malaria suppressive. But even more important, the campaign instilled in the troops and their commanders an awareness of the necessity for the most thoroughgoing malaria discipline. The rigid malaria control measures, so much a feature of subsequent operations in the Southwest Pacific, were in large measure the fruit of the Papuan experience. The campaign also drove home the lesson that, as a general rule, field kitchens and sterilizing equipment should go with the troops and that failure to bring them forward might jeopardize the health of the entire command. It reaffirmed the age-old lessons that to be effective in combat the troops could not be allowed to go hungry and that they needed such minimum amenities as occasional hot meals, a little variety in the ration, and a chance to rest and clean up after being too long in action. the only result, strategically speaking, was that after six months of bitter fighting and some 8,500 casualties, including 3,000 dead, the Southwest Pacific Area was exactly where it would have been the previous July had it been able to secure the beachhead before the Japanese got there. 1. In this press release General MacArthur's headquarters announced that the losses had been low, less than half those of the enemy, battle casualties and sick included. It gave as the reason for this favorable result that there had been no need to hurry the attack because "the time element was in this case of little importance." Communique, United Nations Headquarters, Australia, 28 Jan 43, in The New York Times, 29 Jan 1943. General Eichelberger has written: "The statement to the correspondents in Brisbane after Buna that 'losses were small because there was no hurry' was one of the great surprises of my life. As you know, our Allied losses were heavy and as commander in the field, I had been told many times of the necessity for speed." Ltr, Gen Eichelberger to author, 8 Mar 54, OCMH files. 2. Ltrs, Gen MacArthur to Gen Eichelberger, 13 Dec 42, 25 Dec 42, copies in OCMH files; Interv with Gen Eichelberger, 31 Mar 50; Eichelberger Our Jungle Road to Tokyo, p. 42. 3. Ltrs, Gen Eichelberger to Gen Sutherland, 18 Dec 42, 30 Dec 42, copies in OCMH files. 4. The 7th, 14th, 16th, 18th, 21st, 25th, and 30th Infantry Brigades, and the 2/7 Cavalry Regiment a total of between 18,000 and 20,000 men. 5. Average and total American and Australian front-line strengths by unit for the periods indicated can be obtained from the applicable ALF Opns Rpts and G-3 Opns Rpts, both in G-3 Jnl, GHQ SWPA. For the Australians, the figure given is an approximation since no precise figures on actual Australian front-line strength are available. Ltr, John Balfour to author, 21 Dec 51. 6. Signal, Australian Military Headquarters, Melbourne to the Australian Military Mission, Washington, No. MW-179, 22 Jun 50, abstract in OCMH files. It should be noted that in these figures the missing in action are carried as killed in action and hence are not listed separately. 7. Rpt, CG Buna Forces, p. 105; 163d Inf, The Battle of Sanananda. 8. The figures given are for the entire Papuan Campaign, including the period 22 July through 16 November, in which the Australians lost 2,127 killed, wounded, and missing. Combined Australian-American casualties for the fighting at the beachhead, the last phase of operations, were 6,419 killed, wounded, and missing. There were 2,701 more casualties in the Papuan Campaign than on Guadalcanal, where 1,600 were killed, and 4,245 were wounded, but there, during much of the fighting, the positions were reversed: the Japanese were attacking, and the Americans were holding a fortified position. 9. Ltr, Gen Blamey to Gen MacArthur, 27 Dec 42, in G-3 Jnl, GHQ SWPA; Ltr, John Balfour to author, 12 Mar 50; Interv with Col Teesdale-Smith, 11 Dec 50; Rpt on Opns 18th Inf Bde Gp at Sanananda; Buggy, Pacific Victory, p. 213. 10. Ltr, Gen Eichelberger to Gen MacArthur, 14 Jan 43, copy in OCMH files. 11. Rpt, CG Buna Forces, p. 106. 12. Ltr, CG 32d Div to GOC NGF, 14 Nov 42, sub: Strength Rpt, copy in OCMH files; 32d Div Strength Rpt, Ser 6450, 20 Jan 43; Memo, Col Tomlinson for CG 32d Div, Ser 6455, 20 Jan 43; Msg, G-4, 32d Div to G-3, 32d Div, Ser 6515, 22 Jan 43. Last three in 32d Div G-3 Jnl. Attached divisional troops flown out on 22 January with the 126th Infantry numbered 20 officers and 141 enlisted men. Thus, as moved that day, the entire regiment with all attachments totaled 52 officers and 720 cnlisted men. 13. AMF, The New Guinea Campaign, Battle Casualties, incl to Ltr, John Balfour to author, 15 Mar 50. 14. Rpt, CG Buna Forces, p. 105; 163d Inf, The Battle of Sanananda. 15. Ltr, Maj Herbert B. Shields MC, Actg Div Surgeon, 32d Div, 4 May 43, sub: Monthly Sanitary Rpt; Col De Pasquale, MC, Surgeon 32d Div, Medical Hist of 32d Div, 1 Jan 43-30 Jun 43; Ltr Col De Pasquale to TAG, 4 Oct 43, sub: Sanitary Rpt for the Month of September 1943. All in The Surgeon General's Historical File. Rpt, CG Buna Forces, p. 105. 16. Col De Pasquale, Medical Hist of 32d Div, 1 Oct 43-31 Dec 43, in The Surgeon General's Historical File. 17. No final figure can be found covering the total Japanese commitment in Papua. The figure given, the total of all known Japanese movements to Papua since 22 July, as developed in the narrative above, agrees closely with contemporary estimates, notably with those contained in AMF, The Battle of the Beaches, p. 116, and Buggy, Pacific Victory, p. 213. 18. ALF Daily Opns Rpt, No. 295, 3 Feb 43. 19. Major Koiwai arrived at Basabua with his battalion on 16 August 1942. He led it across the Owen Stanleys to Ioribaiwa and back. On 28 January 1943, after filtering through the Australian lines, he reached Bakumbari with 150 others of the 41st Infantry. An aggravated case of malaria, picked up at Buna, caused him to be invalided out of the service, and was probably the main reason why he was available for questioning at the end of the war. 18th Army Opns I, p. 39; GHQ FEC G-2 Hist Sec, Interv of Maj Mitsuo Koiwai, Tokyo, 11 Aug 47, copy in OCMH files. 20. GHQ FEC G-2 Hist Sec, Interv of Maj Koiwai. 21. Ltr, Gen Waldron to Gen Ward, 5 Mar 51. 22. 32d Div, G-4 Rear Echelon, Recapitulation of Air Shipments, 13 Nov 42-23 Jan 43; 32d Div AAR, Papuan Campaign; Craven and Cate, The Army Air Forces in World War II, IV, 121, 122, 126, 713, 714. 23. Interv with Col Moffatt, 30 Oct 49; Hist Port Det E, COSC Buna; 32d Div AAR, Papuan Campaign; 32d Div QM Section, Rpt on Activities, Papuan Campaign. It will be recalled that by the end of December, the freighters alone had brought in more than 3,000 tons of cargo, exclusive of vehicles and tanks. Between 19 November 1942, the date of the first contact with the enemy, and the end of the campaign, the total tonnage delivered by sea (exclusive of tanks, vehicles, and road building equipment of whose weight no record was kept) was 8,560 tons. 24. Ltr, Col W. J. Paul, Dir, Air University Library Maxwell Field, to Gen Ward, 5 Apr 51, with incl, 32d Div AAR, Papuan Campaign; Craven and Cate, The Army Air Forces in World War II, IV, 124, 125, 126. 25. Ltr, Gen Eichelberger to Gen Sutherland, 22 Dec 42, copy in OCMH files. 26. G-3 Daily Periodic Rpt, American Forces Buna Area, 21 Dec 42-23 Jan 43.